As a small business owner, getting your business set up is the first milestone. Once everything is filed and approved, you are ready to hire staff. 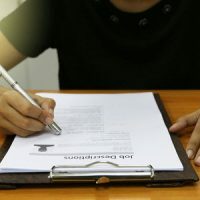 If you are hiring for a position that includes an employment contract, you may be unsure what should and should not be included. This is one of the areas where having a Washington, DC business law attorney on retainer comes in handy. Your business attorney can draft an employment contract that adheres to all federal and various state laws, and ensure your contract will hold up in court in the event your employee pursues legal action against you. Your employment contract needs to have important identifying information like the job title and what the position entails. It should describe the job, what department the employee reports to, who their boss is, and what measurements are used to evaluate job performance. Be sure to spell out what the employment classification is, like an employee or contractor. This ensures insurance and tax compliance. It’s important to be sure the employee is properly classified, or you could face a claim down the line. Define the contract’s duration. Is this an ongoing position, or is it only for a set amount of time? Include the number of hours you expect him or her to work under this contract and what your position is on working remotely. All benefits and job salary should be clearly spelled out. The salary should denote whether it’s hourly or an annual salary, how overtime is handled, and what types of bonuses, raises, and incentives are available. Spell out all benefits the employee will receive with this position. This can be everything from health insurance and 401K matching to child care benefits and a company car. What is your policy regarding vacation and sick time. Thoroughly explain how many days the employee gets per pay period and do vacation days increase with tenure. You should explain any expectations on how family emergencies, unpaid leave, and sick days are handled. Is there an option for employees to make up those hours? Does your business have sensitive information and private client data that is important to protect? If so, you should have this person sign a confidentiality agreement. You can make it a separate contract or include it as a separate section in the employment contract. You should also spell out what is expected of the employee when it comes to privacy. Are they allowed to use social media on a company computer? You can also spell out how mentions of the business are handled so you can hopefully avoid anything negative being said online. Include terms regarding termination. What is required to terminate the contract, is there severance, and what is required after the termination? If you need assistance with drafting an employment contract or have any other pending business law matters, contact Tobin, O’Connor & Ewing to schedule a consultation. Our Washington, DC business law attorneys are eager to assist you throughout each step of your case.